With the addition of two final qualifiers from this weekend’s Ficker Cup Presented by Porsche regatta, the 2016 Congressional Cup roster is set and ready to rumble. Already, a dozen competitors from around the globe – including ten of the world’s top ranked match racing skippers – are in Long Beach, tuning up for matches that begins tomorrow April 6, and continue through April 10. The competition promises to be fierce, if the Ficker Cup Presented by Porsche is any indication. Stephen Van Dyck, one of 14 umpires and officials brought in for the World Match Racing Tour event, called last week’s racing, “an extremely high level of competition; as great as I’ve seen in this event.” Van Dyck, a winning America’s Cup tactician, and involved in the Congressional Cup since its inception, knows great sportsmanship. “It’s very impressive, the standards the competitors have risen to,” he added. “It’s a very good preview of what’s to come next week,” concurred Scott Dickson (USA) who earned his berth in the Congressional Cup after three days of tight racing in the Ficker Cup Presented by Porsche. 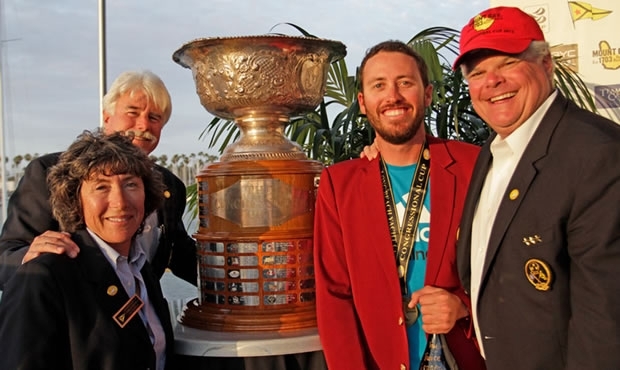 The excitement steps up a notch Wednesday through Sunday, as two-time Congressional Cup defending champion Taylor Canfield (ISV) returns to hosting Long Beach Yacht Club eager for a hat trick. Previous champions – Ian Williams (GBR), who won in 2011 and 2012, and 2009 winner Johnie Berntsson (SWE) – having worn the Crimson Blazer and tasted victory in Long Beach, are expected to be on the attack, along with Phil Robertson (NZL), who lost match point to Canfield by just two seconds, last year. Other top ranked skippers in the line-up include: Sally Barkow (USA), Sam Gilmour (AUS), Bjorn Hansen (SWE), Eric Monnin (SUI), Nicolai Sehested (DEN), Chris Steele (NZL), and Keith Swinton (AUS). All-in-all, the field spans eight nations, and two generations, and includes 10 of the world’s top 15 skippers, as determined by World Sailing, the world governing body for the sport of sailing.